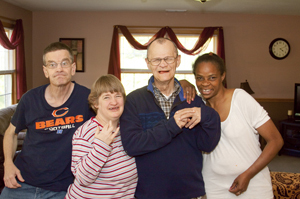 CTF ILLINOIS is dedicated to empowering individuals with developmental disabilities and mental illness to LIVE. WORK. ADVOCATE. Our success is measured in the number of lives we touch with the quality programs and services that we provide. These programs are fueled by our dedicated staff, caring volunteers, and generous donors. CTF ILLINOIS offers a wide range of programs and services striving to meet the needs and choices of each individual we serve. We support individuals and their families by providing personailized planning and various resources to assist them in creating their life-long journey. Feel free to navigate through our supports via the links on the right, encompassed under our motto to LIVE. WORK. ADVOCATE. If you have additional questions about our services, please call us at (708)429-1260.